Ohrid, the jewel of Macedonia and undoubtedly a tourist hotspot. There are many beautiful places to visit in Ohrid. Ohrid is a small city in the southwest, only a 2-hour drive from the capital with the best rates from Skopje Taxi. The city has some fascinating historic pedigree earning it a place on the UNESCO’s World Heritage List in 1980. The main attraction is the majestic Lake Ohrid. It lies on the border with Albania and it is the closest Macedonia comes to having a seaside. With this in mind, Ohrid is a popular summer resort destination favored by the locals, as well as foreigners. 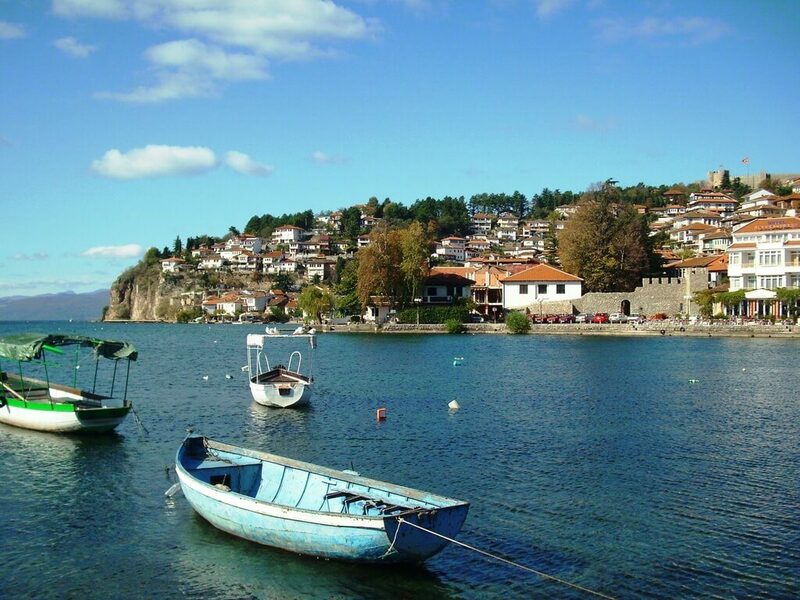 Ohrid is popular for a day trip coming from Skopje. But we recommend you to stay for at least 2 full days in order to experience the most in this city. Lake Ohrid is one of Europe’s oldest and largest lakes. It is more than a million years old with a surface area of 388 km2. The lake and the city of Ohrid are UNESCO World Heritage Sites for their cultural and natural significance. You can find the boats at the Ohrid Marina and you can go on a one-hour lake tour for about 5 euros per person. The scenery is truly amazing. There’s also an option to see the church of St. Naum and the black Drim springs. The monastery of St. Naum sits on a rocky outcrop at the southernmost part of the lake. 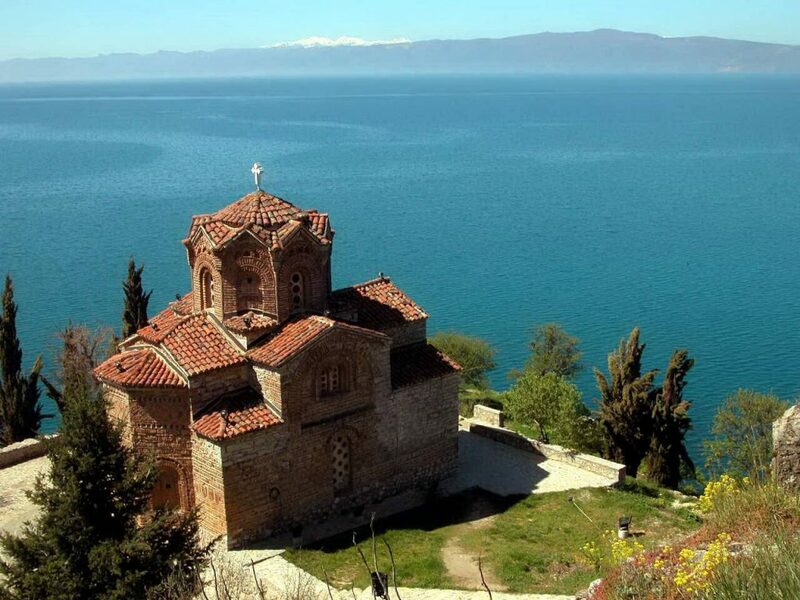 St. Naum is a cross-shaped church with a stone facade that enjoys a picturesque over Lake Ohrid. After his death in 910, St. Naum was buried within the monastery. Tourists and locals alike press their ears to his tomb to see if the local legend is true. Legend says you can still hear his heartbeat. Inside the monastery you will also find 16th and 17th century frescos. 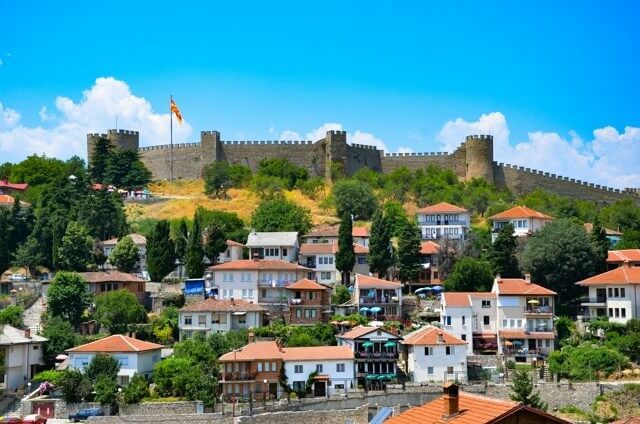 Ohrid’s most dominant landmark is the mighty fortress that sits on the hilltops over the old town. Named after Tsar Samuel, it was the capital of the First Bulgarian Empire at the end of the 10th century. Archaeological evidence also suggests an even older fortress built on the same spot. Thanks to the renovations in 2003, visitors are able to climb up the steep stairs to walk along the fortress’ ramparts. The view from the top is hard to beat as you can see the whole old town. You can also look out at the lake in both directions. Entry costs half a euro (30 MKD). While you’re at the fortress make sure to visit the popular and scenic church of St. John the Theologian. This icon of Ohrid sits on the very point of the headland, by the forests below Samuel’s Fortress. 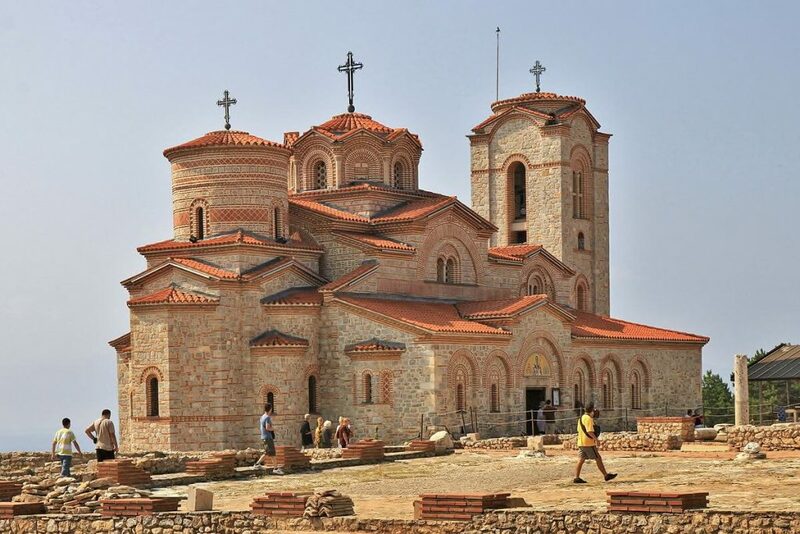 The cliff-top church is quite small in comparison to some of Ohrid’s other churches. But its view definitely trumps all others. The best spot to view the church is from the small lookout point directly above the church. It allows you to capture the classic shot of the church over the lake. 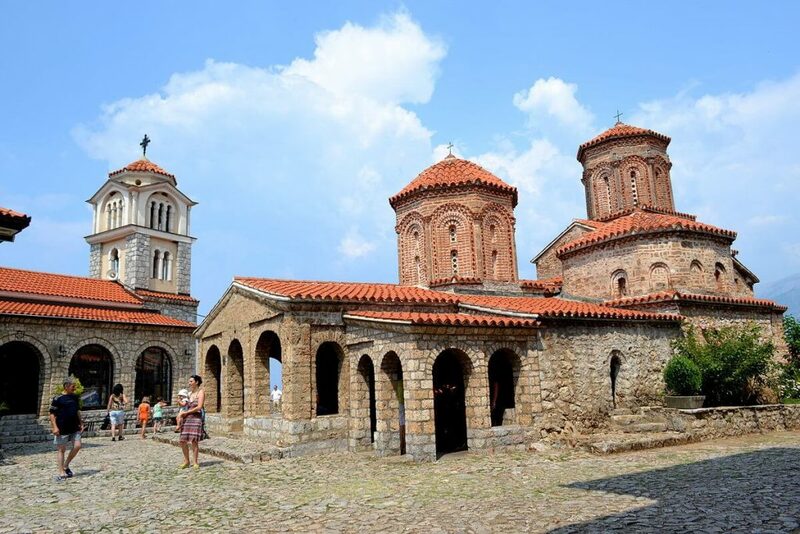 Ohrid is also known as the “Jerusalem of the Balkans” due to its large number of churches. The St. Clement church is on Plaošnik Hill and dates back to the 13th century. It’s known as the St. Panteleimon church and it houses the relics of St. Clement. The most interesting fact is that the church was a mosque in the 15th century (Ottoman period). It was reconstructed back into a church in the 16th century. A visit to St. Clement church will reveal medieval frescos, early Christian mosaics, and Byzantine-style architecture. That is all common throughout the Balkans, and especially in the churches in Ohrid. Close to the city center is the Ancient Theatre, an open-air Hellenistic-style theatre from around 200 B.C. It has a capacity of 4,000 spectators. During Roman times it was used for gladiatorial battles for executing Christians. The theater was forgotten after the fall of the Roman Empire. 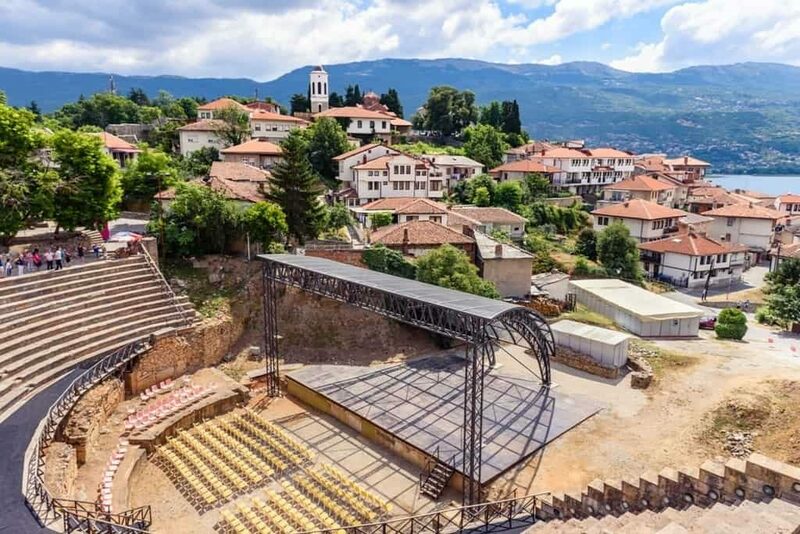 Present day, the theater is a stage during the annual Ohrid Summer Festival. Entrance is free of charge. 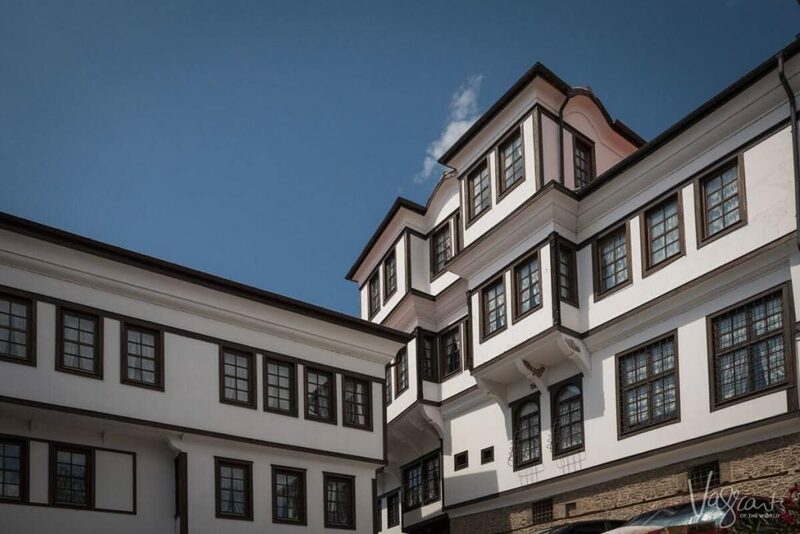 You can find the Robevci Family House Museum in the Old City of Ohrid. It’s a fantastic example of 19th-century traditional Macedonian architecture. It was originally built for the wealthy Robevci family. Robevci lived in the house for 35 years before it burned down. It was eventually completely rebuilt and divided intotwo parts for brothers Konstantin and Atanas Robev. Today the house is a cultural and historic museum displaying memorabilia from the Robevci family. You can also find Roman and Greek artifacts from Ohrid. Touring this family home, its old furniture, and wood carvings gives you a glimpse into Ohrid’s past. The busiest part of Ohrid has to be the bazaar that runs up from the waterfront and ends at the small city market. 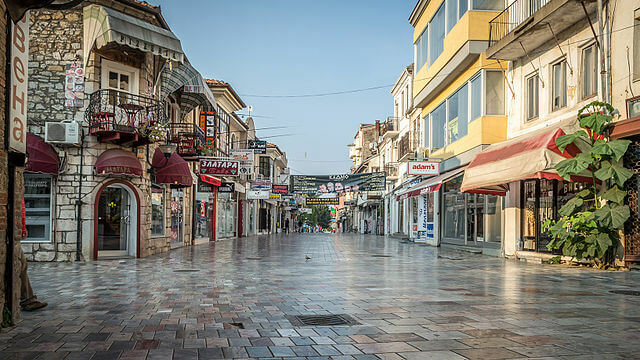 This pedestrian street (St. Clement of Ohrid) is lined with plenty of shops and stores. You can find cafes, ice-cream parlors, and boutique clothing stores. At the northern end of the bazaar is a small square with a water fountain. There’s also the historic Chinar Tree which is over 1000 years old. One of the unique things to do in Ohrid is to check out the famous Ohrid pearls at a local workshop. 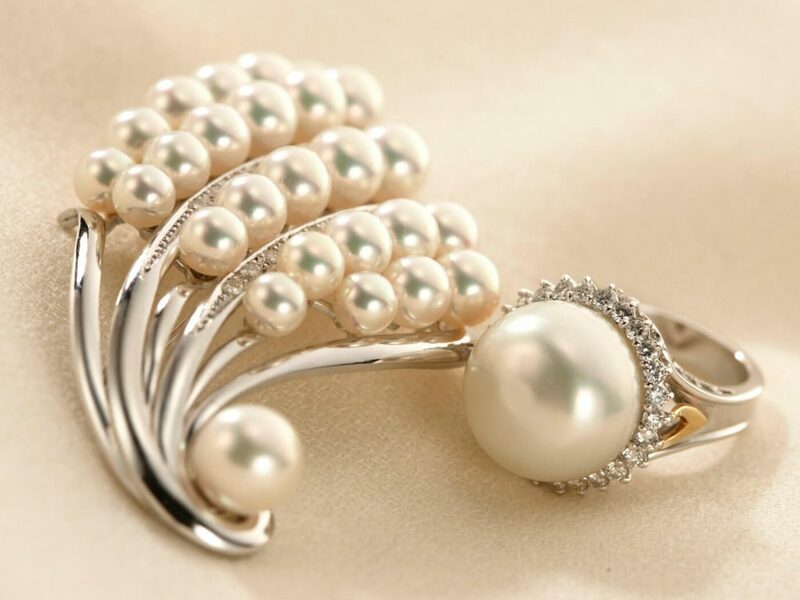 Ohrid pearls are known for their brightness and shine. These qualities are created by a special emulsion made out of the scales of the local plasica fish. The process is a closely guarded secret by the handful of families that have carried on the tradition over the years. 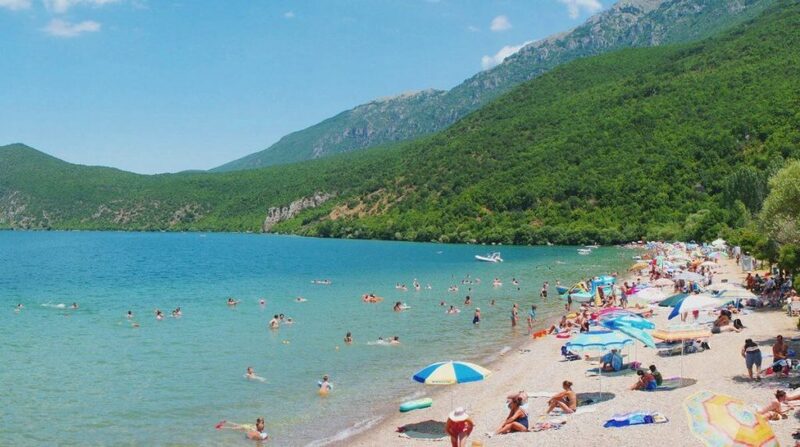 Ohrid has many beaches where you can go swimming in the lake and basking by the shore. There are spots close to the city center with small public beaches between the Port of Ohrid and Kaneo Church. If you’re visiting in summer, it should come as no surprise that the city beaches will be quite busy. At the beaches closer to Kaneo, you can find floating pontoons for sunbathing and swimming that are quieter. Generally, the further you get from the city center the quieter things will be. Hope you enjoy our list of places to visit in Ohrid. As a bonus, if you’re dining in Ohrid, don’t forget to try Pastrmka (Ohrid trout) which is the signature dish of Ohrid. We wish you a wonderful stay in Ohrid! And if you’re planning on visiting Skopje, read our blog post about the places you must visit while in Skopje.